Click here to Submit Data From Drops. Water enhancers (commonly referred to as gels) have been limited in their operational use in recent years. As such, their effectiveness has not been thoroughly evaluated through field testing. Consequently, wildland fire agencies in Colorado do not have access to information about the availability, use, and effectiveness of water enhancers. 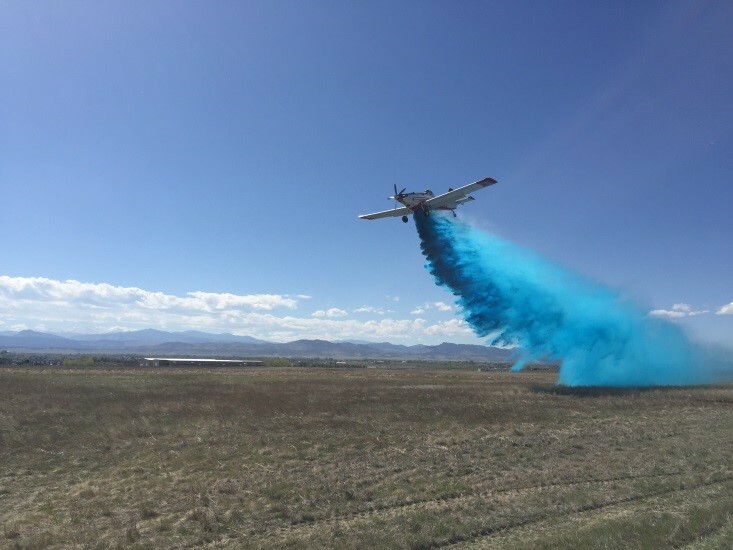 The Center of Excellence for Advanced Technology Aerial Firefighting (CoE), with support from the Division of Fire Prevention and Control’s (DFPC’s) Aviation Unit and the Bureau of Land Management (BLM), is conducting a study during the 2017 and 2018 wildland fire seasons to evaluate the effectiveness of water enhancers on wildfires by using single engine air tankers (SEATs) to test three products. Water enhancers are polymer products added to water to improve fire‑suppression characteristics. The products contain thickeners that improve aerial application performance by minimizing drift and evaporation and increasing adherence to fuels. These products are also known as gels because they form gel-like slurry when mixed with water. While they have been used for aerial suppression in parts of the United States and Australia during recent fire seasons, the majority of previous research investigating the suppressants has focused on direct application in protecting exposed flammable surfaces in the form of structures and wood piles.These studies have used a variety of techniques to investigate how suppressants can extinguish non-spreading (i.e., static) fires or prevent/delay the ignition of flammable surfaces exposed to heat sources. There have been several studies that have been conducted on direct ground-based application in vegetative fuels for the suppression of spreading fires. These studies were limited in their size and repeatability and provided more of a demonstration of a method, rather than a comparison of suppressants or techniques. Did the water enhancer stop or slow the forward advance of the fire? Did the water enhancer reduce fire intensity to a sufficient level for ground crews to manage the fire? Did the water enhancer persist on the surface fuels long enough to prevent hotspots from redeveloping or the fire from burning through the drop? Determine whether water enhancers delivered from a SEAT are effective on wildfires in Colorado. Effectiveness will be viewed in terms of how effective the products were in achieving the desired suppression objectives (e.g., reduction of fire intensity or burn area, coverage of suppressants on the ground, alignment of intended and actual drop areas). Identified major variables influencing the capabilities of specific water enhancers in various applications, such as during line-building, spotting, etc. and brilliant blue (right) FireIce HVO-F®. Prior to this study, Colorado loaded only long-term retardant (LTR) in SEATs. LTRs are chemical concentrates mixed with water that alter fuels so that they do not support combustion. 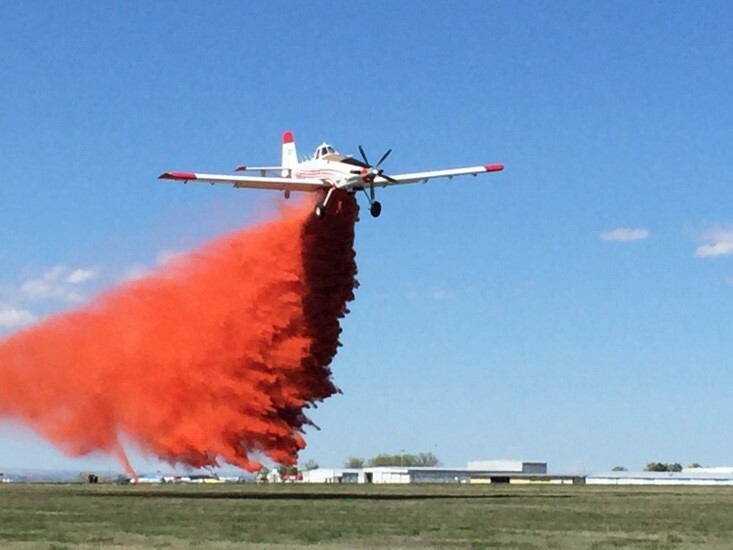 Retardant is dropped adjacent to or ahead of the fire to create a chemically induced fire break at its perimeter. This deprives the fire of fuel, thus retarding the fire’s spread. After the water in the mixture evaporates, residual chemical on fuels continues to reduce the fire’s ability to generate heat, which is particularly useful in fighting high-intensity fires with a distant and indirect attack. LTR is most commonly used because of its long-lasting effect on fires. Water enhancers are available as wet or dry concentrates. They contain polymers or other thickeners that aid plain water in its adherence to fuels, allow buildup of a thick and protective wet layer, and minimize the effects of wind drift during aerial application. Water enhancers modify fire behavior or extinguish fires by absorbing the energy (i.e., heat) being released by the fire because they have increased film thickness. In other words, their molecular bonds slow water evaporation by creating a thermal protective coating. Unlike LTR, water enhancers are mainly dropped directly on the fire (direct attack) to supress or halt the fire long enough for ground resources to access the fireline and mop up or supplement the knockdown process. If ground resources cannot access the fire edge due to terrain or other access issues, the fire may rekindle over time. In this study, the CoE will evaluate the use and effectiveness of three water enhancers: FireIce 561 (uncolored) and HVO-F® (high visibility), BlazeTamer 380®, and Thermo-Gel 200L®. All of these products are approved by the U.S. Forest Service (USFS) for use in SEATs. FireIce HVO-F® is a highly refined, cross-lined polyacrylate copolymer. FireIce is a dry powder that weighs approximately 8.45 pounds (lbs) per gallon when mixed with water. The mixing ratio is between 0.12 and 0.18 lb of powder per gallon of water. FireIce is available uncolored and in one-part orange fugitive coloring.The colorants were developed to be tied to the effectiveness of the product: when a pilot can no longer see the line, then it is no longer effective. This product will be loaded at the State-managed Fort Collins SEAT base. BlazeTamer 380® is a polymeric-elastomer-based water enhancer designed for deployment by aircraft to suppress wildfires. It contains a mix of polymers, surfactants, water, and other ingredients, and is uncolored. BlazeTamer 380® is a liquid concentrate that weighs approximately the same as water. The mixing ratio is .65% concentrate for each gallon mixed. This product will be loaded at the BLM-managed Rifle SEAT base. Thermo-Gel 200L® is a hydrophilic polymer based in mineral oil and contains a blue colorant. It is packaged in a liquid concentrate form that, when added to water, transforms into a heat-absorbing gel. The water-filled gel particles adhere directly to the burning material and, in doing so, aid in the quick extinguishment of fire. It has a mixing rate between .5% and 3% of each gallon mixed. This water enhancer will be loaded at the BLM-managed Craig SEAT base. SEATs loaded with water enhancers will respond to fires on State and private land, as well as to fires under the jurisdiction of BLM, the National Park Service, and USFS. Mixing will be at the recommended ratios in the USFS Qualified Products List for each product on all drops. For operational planning and awareness purposes, State-contracted or BLM-contracted SEATs flying from one of the three bases will be loaded with the aerial suppressants specified above on the first load, unless the ordering unit clearly indicates that LTR is needed instead. Any additional loads (i.e., LTR, water enhancer, or water) will be at the discretion of the Incident Commander. Decisions regarding where, when, and how to apply LTR or water enhancer are typically under the discretion of the Incident Commander, so if at any time the Incident Commander or the Air Tactical Group Supervisor feels that the enhancers are not performing as desired, the Incident Commander can immediately order that the SEATs be loaded with retardant. An Interagency Information Bulletin was prepared and has been issued to provide increased awareness and information about the study to all impacted agencies. The use and effectiveness of these products will be evaluated by ground firefighters, SEAT Base Managers and/or SEAT Managers, and the aerial supervision community through robust data collection forms. In addition, SEAT Pilots will record their observations and impressions as to the performance of the water enhancers. When available, the DFPC Multi-Mission Aircraft will also record images and videos before, during, and after drops. A preliminary report on the use of water enhancers during the 2017 and 2018 fire seasons, including how many fires the water enhancers were used on, the locations of the fires, how much water enhancer was used, cost, fuel types, etc. Should we keep using water enhancers? When should we use them over LTR?